Whilst Subaru sales staff may find it a tad difficult at times to shift cars out of showrooms, Subaru of America’s having an absolute field day in the United States. With demand for the Outback, the Forester and the Crosstrek continuing to grow, it appears Subaru’s USA outpost has struck a chord with many buyers stateside. There are, though, a handful of outliers, with perhaps the most surprising being the relatively slow-selling Legacy sedan. Why are we surprised, you ask? Because it’s a genuinely good mid-sized sedan that we feel many are missing out on. The Subaru Legacy is quite a commodious car by class standards. 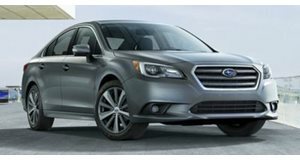 It would be quite surprising to hear of a mid-sized sedan that wasn’t very spacious, so there won’t be any shocks upon finding out the Subaru Legacy is quite a commodious car by class standards. On top of the plentiful array of sizeable storage compartments (with our favorite being the tray that can be accessed by lifting the top part of the center armrest) and big, broad seats up front, room in the back is also plentiful for the most part. We say “for the most part”, as we are disappointed with the compromised rear head room on offer in the Subaru Legacy. Though leg room is especially generous – even with the front seats pushed back to accommodate taller drivers and passengers – the same story cannot be said for head room as a result of the sloping rear roofline. Better still, the rear seat backs fold down almost completely flat if you need even more luggage room. Things do improve once you start looking at the trunk. At 15 cubic feet, the Subaru Legacy’s luggage capacity is on par with similarly-sized rivals, and the wide aperture should make it easier to slide bigger items in and out. Better still, the rear seat backs fold down almost completely flat if you need even more luggage room, and the seat releases in the trunk mean you don’t need to clamber back into the passenger compartment to increase the cargo-carrying capacity. It is worth pointing out, though, that there’s a fairly prominent trunk lip on the Legacy, which could prove to be problematic to owners who’ll be regularly lugging about heavier or more awkward-to-carry items. Buyers who’ll also be wanting the plushest interior possible might (if they’re willing to compromise a bit on outright practicality) opt for an executive premium sedan like a BMW 3 Series or a Jaguar XE, as the Subaru Legacy doesn’t have an amazingly-finished interior. That said, everything is screwed together well, the materials are of a good overall quality and, whilst the overall layout may be a bit bland, the controls are simple and intuitive to use – with the touchscreen interface perhaps being the highlight of the Subaru Legacy ergonomically. Even in its most powerful guise, it would be a bit of a misnomer to call this mid-sized vehicle a ‘sports sedan’. Subaru may have put itself on the map a couple of decades ago with the original motorsports-derived Impreza WRX STi, but that performance credence didn’t necessarily find its way into other models. Take the current Subaru Legacy as a prime example: even in its most powerful guise, it would be a bit of a misnomer to call this mid-sized vehicle a ‘sports sedan’. That’s not to say the Subaru Legacy isn’t enjoyable to drive for the more devoted driving enthusiast. Whilst outright thrills are kinda off the table, a combination of light, responsive steering, good all-round visibility and admirable amounts of traction does mean the Legacy isn’t uninspiring to drive. The Subaru Legacy also has the distinction of coming with permanent all-wheel drive as standard. What will undoubtedly matter more on the day-to-day basis, though, are areas like refinement and ride quality – and it’s here where the Subaru Legacy fares better. Admittedly, the ride can be a little bit crashy over rougher surfaces, but everywhere else the Legacy managed to iron out the imperfections in the road with admirable ease, and a decent job is made of quashing wind and tire roar. Factor in the rather comfy seats, and you have the makings of a vehicle that works rather well as a highway mile muncher. The Subaru Legacy also has the distinction of coming with permanent all-wheel drive as standard – with the system itself being a very good one. When driving on slipperier surfaces like snowed-over roads or dirt trails, the Subaru Legacy does handle the tougher terrain with relative ease, and (in conjunction with the traction and stability control) should mean you’ll overcome all but the most adverse conditions that Mother Nature can throw at you. For sure, it’s no Jeep or Land Rover, but the Legacy will get the job done. For the far greater percentage of you who are looking at value for money, we’ll instantly suggest the smaller 2.5-liter engine. If you’re willing to splash as much money as possible in order to have the most powerful Subaru Legacy you can buy, then by all means go for the 3.6-liter engine option. 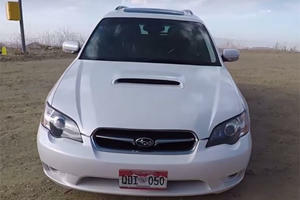 Fuel consumption figures aside, it’s objectively the better of the two engines you can specify for the Legacy, and those who have the money to spend will undoubtedly be satisfied with their purchase. However, for the far greater percentage of you who are looking at value for money, we’ll instantly suggest the smaller 2.5-liter engine is the one you should go with. Yes, it’s not the punchiest option (175-hp and 174 lb-ft of torque, versus the 3.6’s 256-hp and 247 lb-ft outputs), but there’s enough grunt in the 2.5-liter to bring the Legacy up to speed in an appropriately prompt manner, and the ‘flat’ engine configuration of both engines means they’re quite smooth and refined. Yes, if we were forced at gun point to pick our preferred choice, it would almost certainly be the 3.6, but there genuinely isn’t a huge amount of difference between the two. No matter which engine you go for, though, the Legacy you pick will only have a continuously variable transmission (CVT) automatic available for it. What really makes us prefer the 2.5-liter, though, is that it’s far more fuel efficient. According to the official figures, the 2.5-liter Legacy can return 25mpg and 36mpg in the city and on the highway respectively, which contrasts considerably with the 3.6’s 20mpg and 28mpg statistics. Further making the 3.6 even less cost effective is that it’s locked to the top-tier, £32,460 ‘3.6R Limited’ trim – making it nearly three grand more expensive than a like-for-like 2.5-liter Legacy, and nearly $10,000 pricier than the base spec car. No matter which engine you go for, though, the Legacy you pick will only have a continuously variable transmission (CVT) automatic available for it. Though CVTs were once notorious for being a bit iffy, though, Subaru’s system works rather well, with its smooth and fairly seamless operation being qualities we wouldn’t associate with CVTs not so long ago – and, if you really need to feel like you’re in control, models with the wheel-mounted gearshifting paddles allow you to simulate changing gear. Long story short, it says a lot about a CVT when the biggest problem we have with it is that the ‘Lineartronic’ name it’s been given is a bit awkward. If your budget extends far enough, we also recommend Subaru’s very clever ‘EyeSight’ system. The Subaru Legacy is already a good value proposition, and that status is further reinforced by the pleasant amount of equipment that comes as standard fit across the range. The base, $22,815 ‘2.5i’ model, for instance, gets a reversing camera, climate control, an electric parking brake and the slick touchscreen interface and all-wheel drive system we mentioned earlier. Perhaps the better option, though, is to upgrade to the ‘2.5 Premium’ spec, which adds 17inch alloy wheels, heated front seats, an upgraded infotainment system and dual-zone climate control for what we feel is a reasonable increase in price to $24,815. If your budget extends far enough, we also recommend Subaru’s very clever ‘EyeSight’ system. Though the $1,495 price is a bit steep for one item, ticking said option box nets you extra safety features (like blind spot warning and a rear traffic warning system that alerts you of any oncoming cars if you’re reversing out of, say, a parking bay) on top of the adaptive cruise control, lane departure warning and pre-collision braking systems that are operated through the pair of cameras that make up the ‘EyeSight’ setup. As we said, it’s an expensive extra, but we feel it’s worth the money if you can afford it. Admittedly, the powertrain has its own separate five-year/60,000-miles warranty. Should niceties like leather upholstery and built-in navigation be reguired, though, then the Premium and Limited trims will be more to your liking. As we stated before, we’d advise you stick to the 2.5-liter option if possible, as we feel the fuel economy benefits outweigh the larger engine’s performance gains, and choosing the smaller engine retains more of the value attributes that make the lower-spec cars that bit easier to recommend. Being a Subaru, residual values should remain fairly strong (if not exactly class-leading), and the amount of equipment that comes as standard on the lower spec trims means the Legacy remains competitively priced when compared with like-for-like rivals. If there’s anything we aren’t quite sure on, it’s the mildly meagre three-year/36,000-miles warranty. Admittedly, the powertrain has its own separate five-year/60,000-miles warranty, and you can pay extra for bumper-to-bumper coverage up to a Kia-rivalling seven-year/100,000-miles limit, but we are a tad disappointed that Subaru’s warranties aren’t as long as those offered by other competitors. It came close but didn't finish the job.